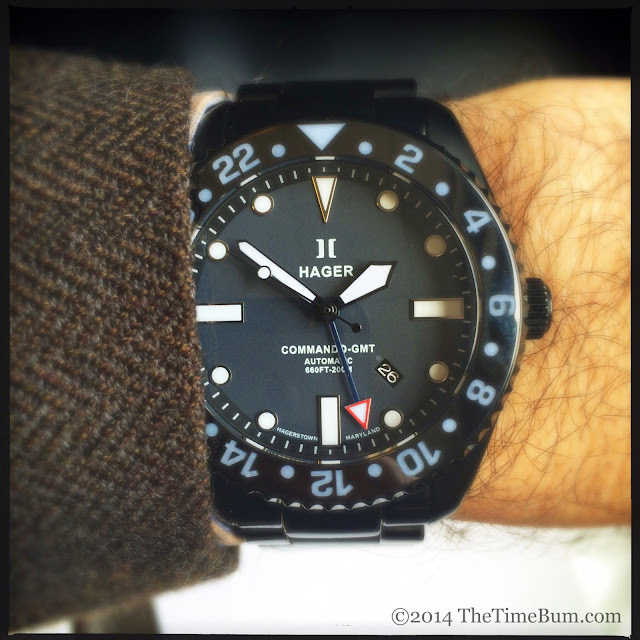 Hager Watches has released their new Professional Series and provided one of each to The Time Bum for a thorough review. Back in my April preview, I told you they looked promising. Now that I have them in hand, I am pleased to report that I was right. 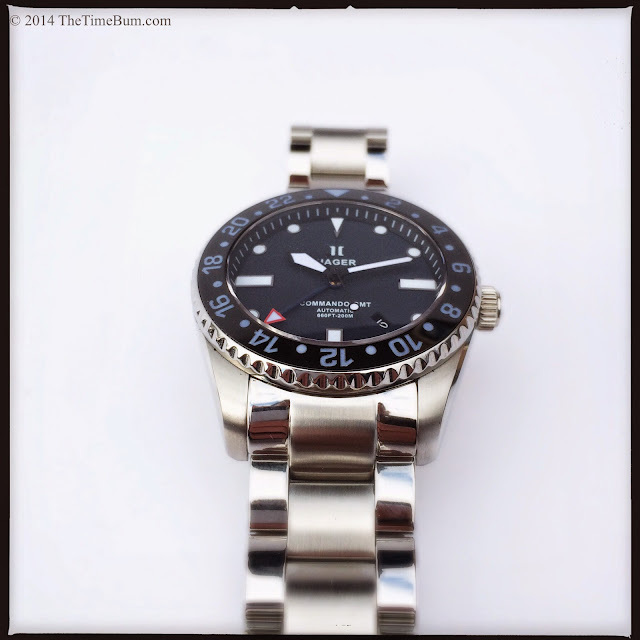 The series has four variants: a three hand Commando Professional and a four hand GMT Traveler, with midnight blue dials and a choice of stainless or black DLC finishes. They have made it from design concept to final product largely intact with some minor improvements, resulting in a set of classically styled divers that are both ruggedly engineered and beautifully finished. I think they represent a solid value in the sub-$1000 price bracket. 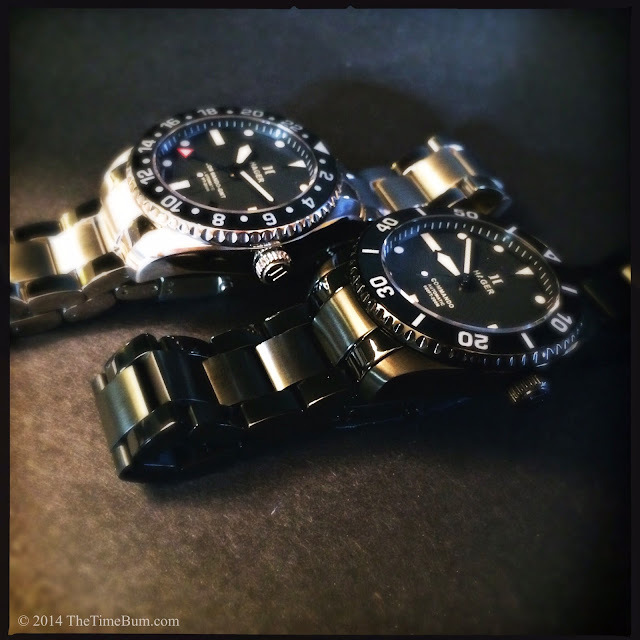 These watches are intended to be "dress divers" and they do not skimp on either aspect. The diver part of the equation is obvious from the specs. The watches are rated for 200 meters water resistance, wear anti-reflective coated sapphire crystals, and are treated with SuperLuminova for nighttime and underwater visibility. They are shipped on a sturdy stainless steel bracelet with a push-button clasp. The Commando has a 120 click, unidirectional timing bezel, while the GMT has a bidirectional 24 click, 24 hour bezel that can be used to track a third time zone. 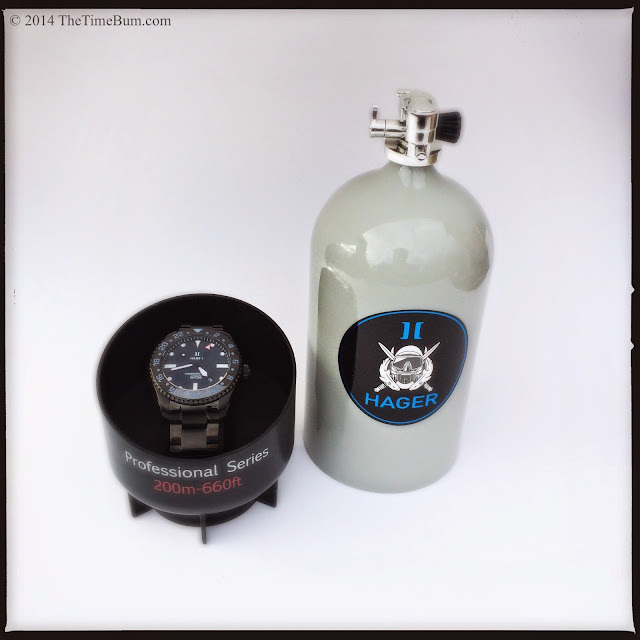 In case you forget what these watches are capable of, they are shipped in "dive tanks" as a reminder. Still, when you lay eyes on these watches for the first time, you might momentarily overlook their utility because they look so damn sharp. The "dress" aspect is immediately apparent, starting with the interesting variety of surface textures and materials. I like mixed finishes on a watch. When done properly, the contrast of bright and matte can enliven a design. The Professionals display this technique to striking effect. The watch is brushed along the upper surface of the case and along the center links of the bracelet. The side links, case sides, crown, and bezel are highly polished, bouncing light along with the glossy black bezel insert. The resulting play of light is arresting, grabbing your eye even from across a room. In an interesting twist, the effect is most pronounced on the black versions. We tend to think of DLC as a stealth finish, but here it is more of a delicious lacquer gloss like that of a Steinway piano or Balmoral Oxford shoe. It is even more fun when you get close enough to appreciate the off-angle distortions in the domed sapphire crystal. First impressions are the most important, and the Professional Series absolutely nails it. 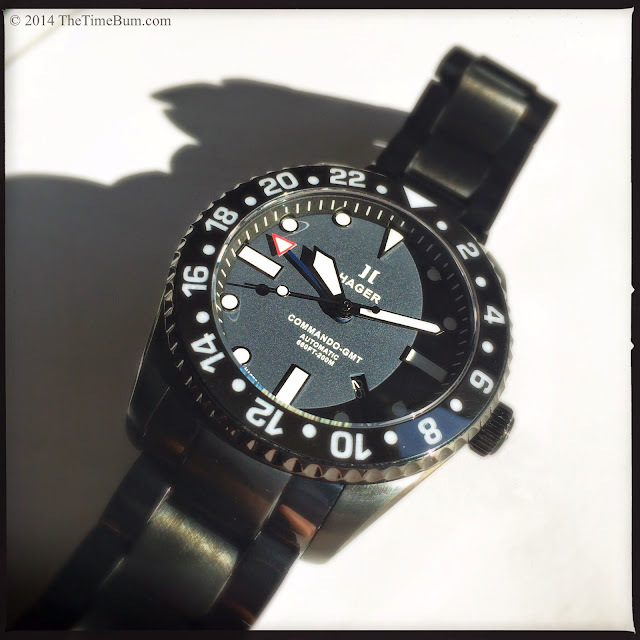 The case and dial designs are conservative, drawing heavily upon those of traditional dive watches. It measures 42mm across, 50mm long, and 14mm thick, which is about standard for a modern mens watch, and makes it easy to wear, even on smaller wrists like mine. The case is round, flowing into tapered lugs that curve slightly downward around the wrist. A beveled edge joins the aforementioned polished sides and brushed top. The coin edged, screw down crown is positioned at 3 o'clock and is decorated with the twin-bar Hager "H" logo cast into its head in high relief. It is easy to grip and operate. The bezels, on the other hand, were too tight for my taste. A bit of downward pressure at the top of the bezel gets it moving, but the action is extremely firm and there is little surface area to grip. I found them difficult to operate. Once they get rolling, you can appreciate their solid, mechanical feel, but it was all too tough on the fingertips for me. A little relaxation in this department would go a long way. The dial is also familiar at first blush, with applied dots and bars for markers and an inverted triangle at 12 o'clock, along with sword hands and a lollypop second hand. 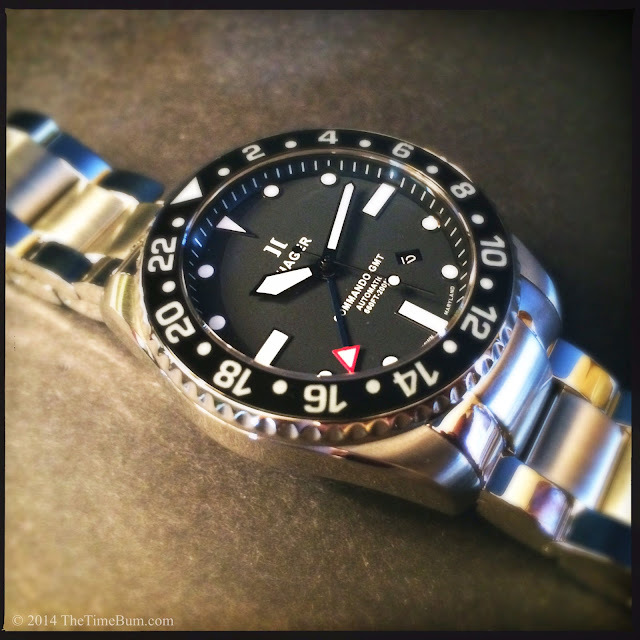 The GMT adds a red arrowhead to mark the second time zone. As one might expect from a watch designed by a U.S. Marine, it is all very buttoned down and squared away. The real joy comes in examining the details. For starters, the hands and markers are not polished like those on many other divers, but edged in gloss black. 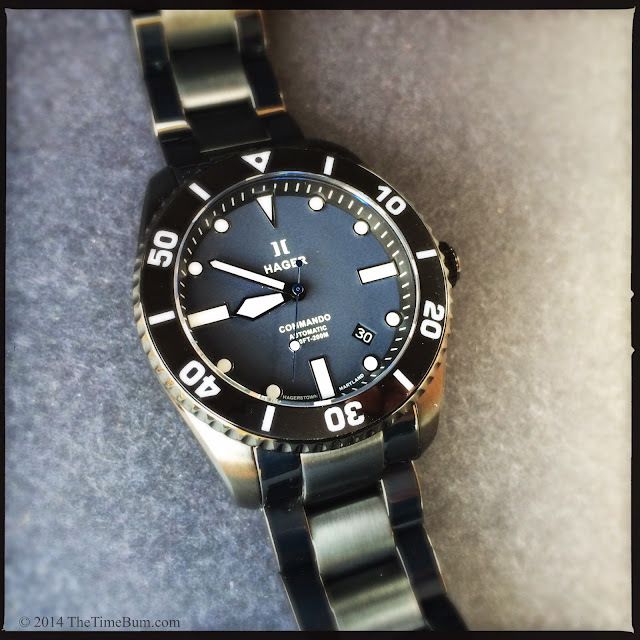 The dial is an inky midnight blue with a matte finish. In most light it appears as a slate color, but in sunlight the deep blue tones come forward. The effect is also more prominent when you pair the watch with blue clothing or straps. 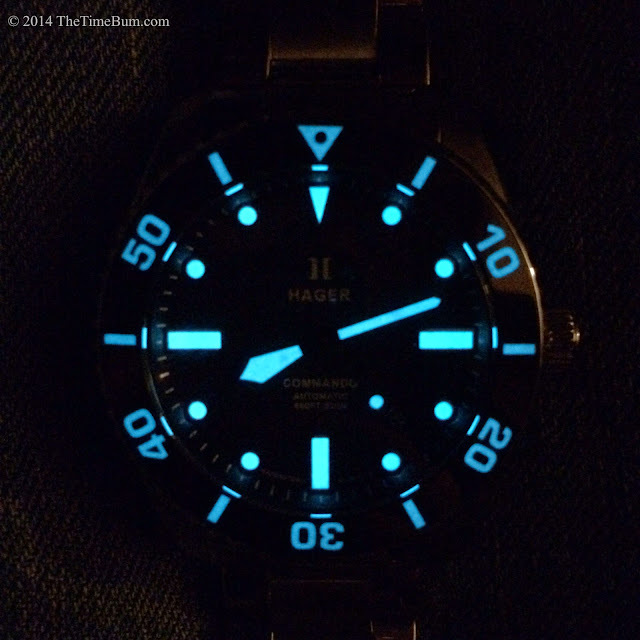 SuperLuminova also adds to the color play, appearing white on the hands and markers, and a translucent blue on the black bezel. The chapter index and 4:30 date wheel are both white-on-black, perfectly legible but drawing no undue notice. Text is tastefully restrained. A properly proportioned Hager brand and logo are up top, with a small print model name, "automatic," and water rating printed down below. Peer at the very fine print at the bottom edge of the dial and you see another uncommon detail "Hagerstown, Maryland." This is the home of Hager Watches and the place of their of final assembly. 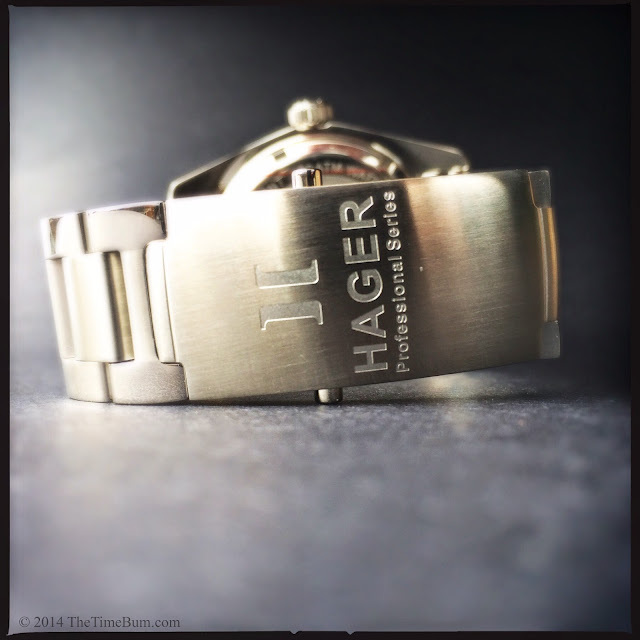 Case backs are solid and etched with the Hager brand. Lurking within, you will find a modified, high beat, automatic movement. The Commando Professional uses an HRG 52 (Miyota 9015), a widely used hacking, hand winding, 24 jewel movement with a 42 hour power reserve and 28.8k bph oscillation. The GMT Traveler has the HGR 60 (ETA 2836), a 26 jewel, 28.8k bph automatic with a 40 hour power reserve and an independently adjustable 24 hour GMT hand. The GMT is set with crown in position 2, rotated in the opposite direction of the date setting. It can prove tricky to sync local time, GMT time, and date, but if you follow the setting sequence in the manual, you will find it all makes perfect sense. I don't really mind the fact that the three hand unit it hidden, but I wish we had a window on the GMT movement as the photos on the site show some lovely perlage. The bracelet is 22mm wide, tapering to 20mm at the clasp. It is composed of solid links secured by split pins. There is reassuring heft in the piece, and as noted above, it is impeccably finished. The bifold deployant clasp has an integral wet suit extension and operates smoothly, locking with a firm snap, and unlocking with the depression of two buttons positioned on either side to prevent accidental release. The clasp looks the business too, it is about an inch and a half long and signed with the Hager brand, logo, and series designation. My only complaint is the length. There is more than ample room for large wrists, but I could not manage more than a loose fit, even with all of the pinned links removed. In fairness, my 6.5" circumference wrist is pretty small, and the fit was not sloppy, but rather the sort of loose fit many men prefer. Still, I like my watch snug. A qualified watchmaker should be able to remove one of the pressure fit links without much fuss. On the wrist, I found the Professional Series watches easy to wear. The bracelet proved to be too much but it was a snap to replace with leather. The watch head fit my wrist comfortably and had no problem finding its way under most shirt cuffs. This is important as the watches seem tailor made for dark suits. It has undeniably masculine proportions, and clearly broadcasts its tool watch origins, but it does so with a degree of polish and refinement that is rare at this price point. 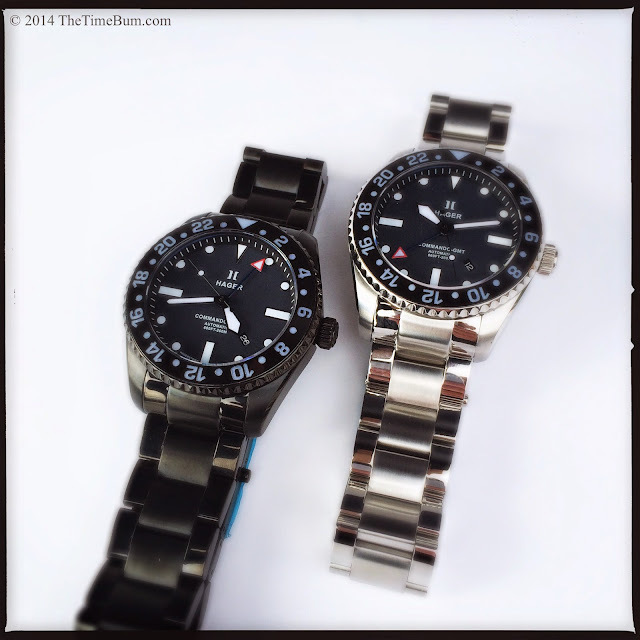 The Commando Professional starts at $600, and the GMT Traveler at $700. DLC adds $100 to the list price of each. The Bum's choice? It's hard to say. 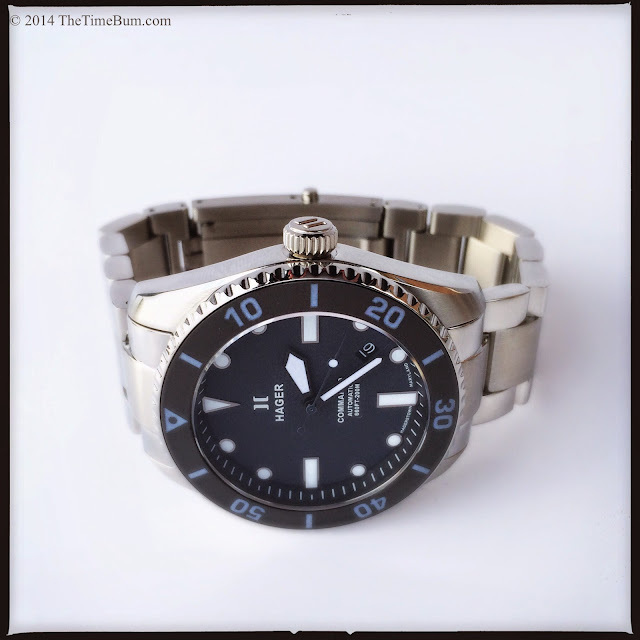 The stainless GMT on a navy blue bracelet would be a knockout with a blue or grey suit, but a black Commando on the black bracelet would be a knockout with charcoal or black. Both would pair equally well with jeans or cords for the weekend, and of course any of them would work with a wetsuit. If you are looking for a true "all-arounder" that dresses up without apology, you should have a look at the Hager Professional Series. 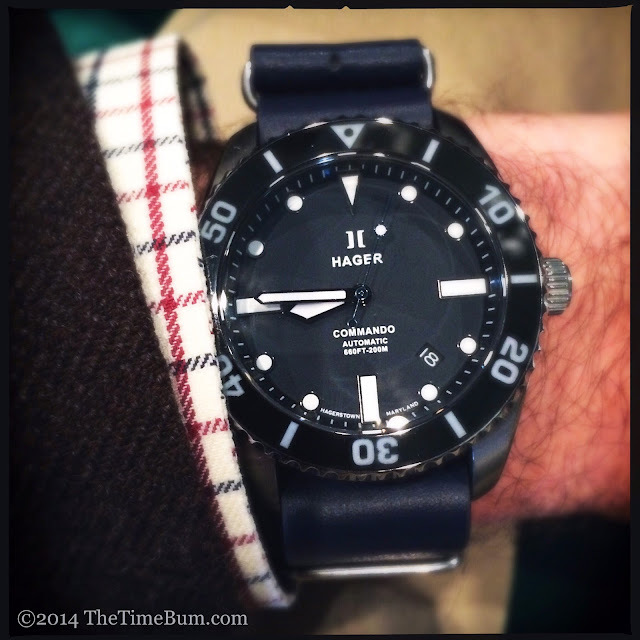 Watches may be ordered directly from Hager's website, but watch nerds in the Washington, DC metro region can see them up close and personal at Fashion Time in Tysons Corner Center, Dulles Town Circle, and Potomac Mills. Sum: A dress diver without compromise. The Time Bum approves.